Hoists are specifically designed to lift wheelchairs and scooters into the back of vehicles. The idea is that by simply pressing a button on a handset you can lift and swing your chair/scooter into the back of your vehicle. Wheelchairs and scooters range in weight from a few kilos up to a couple of hundred kilos and vehicles come in all shapes and sizes. This means that by necessity there are a huge number of different hoists that are available. The following selection should pretty much cover most requirements, but please let us know if you cannot find what you need here. We have separated our hoists by weight (mini, midi and maxi), with a couple of alternative style ones as well. Hoists are available with a 2 way movement (up and down) or a 4 way movement (up, down, in and out). Please be aware that whilst lifting the weight isn’t a problem, it is of the utmost importance that we match the chair to the correct size of vehicle. We spend many hours assessing, demonstrating and ensuring that the finished product meets the expectations of our customers. Please call us before choosing your next car, scooter or wheelchair. 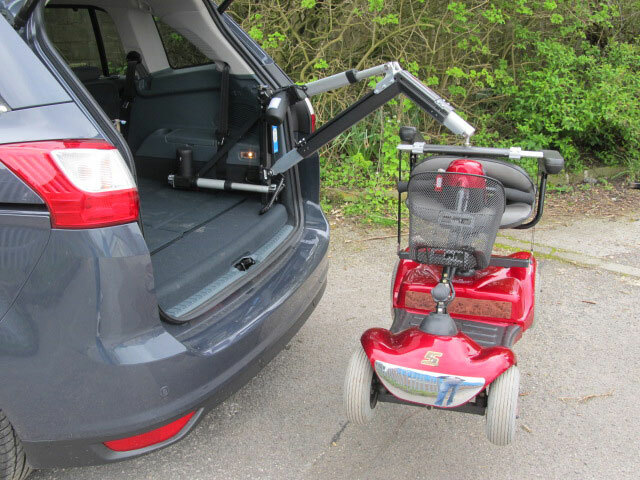 Telescopic hoists are the ideal solution for people with lesser mobility, but with a need to lift chairs and scooters into the back of people carriers and estate cars. Some people struggle to direct the scooter round when using the standard style of hoist as they may need to use crutches, walkers, sticks etc. The Telescopic Hoist simply needs hooking to the scooter or chair and the rest of the movement is carried out without the need for any further assistance. Telescopic hoists have a maximum lifting capacity of 120kg. Mini hoists are primarily designed to lift manual wheelchairs and small mobility scooters up to a maximum weight of 40kg. They come with a 2 way or 4 way movement. 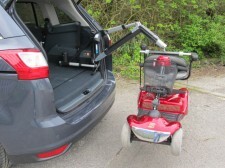 Because they are compact and can be folded down, Mini hoists can be fitted into smaller vehicles such as hatchbacks. We fit a range of Mini hoists with different features depending on what they are lifting and the vehicle they are to be fitted to. Please contact us for advice or a demonstration. Maxi hoists are primarily designed to lift large heavy weight power chairs and mobility scooters up to a maximum weight of 200kg. Because of the weight they have to lift, Maxi hoists come with a 4 way movement only. Due to the size of equipment Maxi hoists have to lift they are most suited for estate vehicles, people carriers and similar vehicles with larger boots. 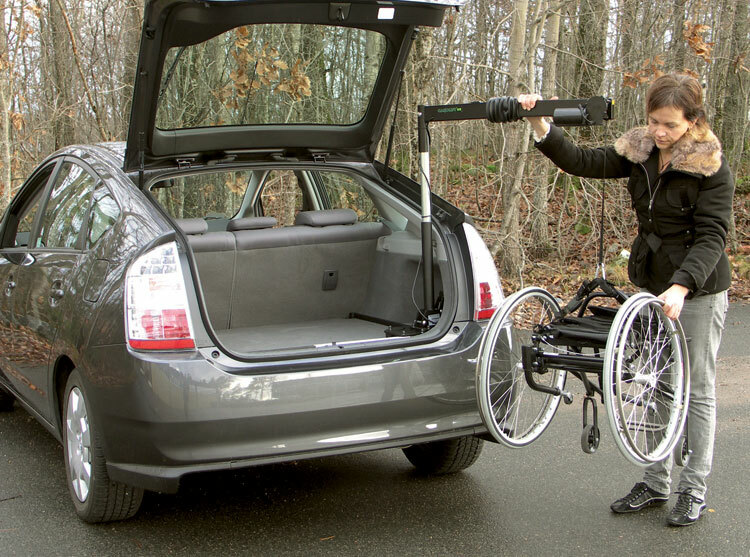 Whilst Maxi hoists are ‘chunky’ because of the heavy weights they are lifting, in most cases the main arm and motors are fully removable leaving just the frame in place. 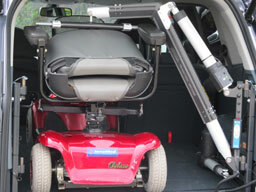 This means that people carriers and 7 seater vehicles can often retain all their seats and keep the maximum load space when not carrying the wheelchair or scooter. We fit a range of Maxi hoists with different features depending on what they are lifting and the vehicle they are to be fitted to. Midi hoists are generally designed to lift medium sized power chairs and mobility scooters up to a maximum weight of 100kg. They are available with a 2 way and 4 way movement depending on the person using the hoist’s requirements. 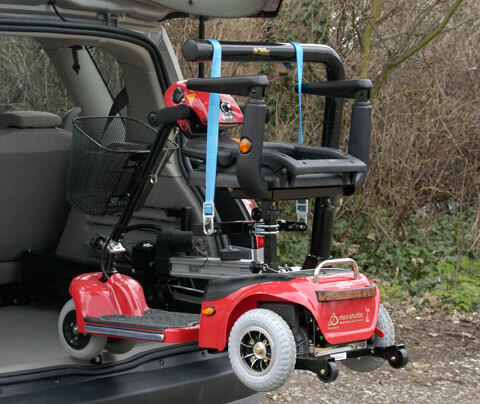 Due to the size of equipment Midi hoists have to lift, they are most suited for estate vehicles, people carriers and similar vehicles with larger boots. Midi hoists are robustly built which enables them to lift heavy weights. In most cases, the main arm and motors are fully removable, leaving just the frame in place. This allows people carriers and 7 seater vehicles to retain all 7 seats and maximum load space when not carrying the wheelchair or scooter. We fit a range of Midi Hoists with different attributes, all designed to suit the item they are lifting and what vehicle they are to be fitted to. Please contact us for advice or a demo.